My guide to the most snugly, compact, gadgety and practical bouncy seats available. Which bouncer seat is right for your kid? From the cozy cuteness of the Snugabunny Bouncer by Fisher Price to the sleek, compact design of the BabyBjorn Babysitter Balance, here is a basic guide to finding the perfect baby bouncy seat for your little person! Is there any such thing as too much snugly for a newborn? I've never thought so, and I don't think many people are inclined to believe as much. That's why the My Little Snugabunny Bouncer Seat by Fisher Price won my heart. It's adorable and cushy and about as much soft, sweet and cozy as a bouncy seat can handle. 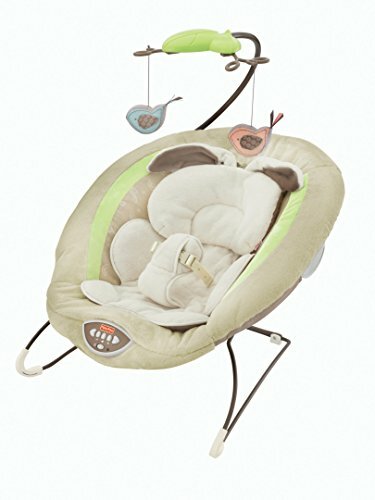 Reviews on the Snuggabunny Bouncer Seat site a few minor issues and a lot of wild raving. People love this bouncer seat, and with good cause. The newborn insert cushions your baby's entire body and snuggles them in so deep and secure that you don't ever need to worry about them bucking or writhing their way out of it. The body insert can be removed as soon as your baby has outgrown it and the head support cushion can be moved up and out of the way of your busy, strong little person once they hit a certain age. The Sunggabunny mobile is very sweet and cute with gentle colors and patterns that are super chic and easy on your little one's eyes. 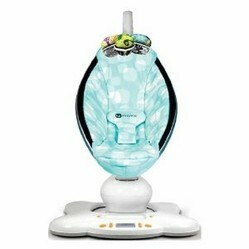 The sounds are quiet, (some say too quiet) and the vibrating option is fantastic for soothing a baby to sleep. Size wise the Sunggabunny Bouncer seat is on the bulkier side of average at just over 8 pounds and 24 inches across, but is still very portable and considered "lightweight." The width of this bouncer seat is something of an issue for some people, as it does take up a bit of space and requires you to watch your step. Most Fisher Price Bouncer seats are this width, though, and if you've purchased their products before then you will be accustomed to their average dimensions. One thing to note: This seat has a 25 pound weight limit. If you expect your baby to be too big for it before he is sitting upright without help then you might want to look for a bouncy seat with a 30 pound limit. At only 16 inches across this little sweetie is a sure bet for a small apartment or for taking on your travels. BabyBjorn held to its tradition of being beautifully simple while designing the BabySitter Balance Bouncer seat and its accessories. If you like clean lines and cool colors then this is likely to strike a positive chord with you. Don't let the price tag fool you- this thing is worth ever penny. Or so say the reviewers. While many people had a hard time laying down the money, they've almost all found that this piece of equipment more than met their needs. The compact size isn't the biggest perk, though its narrow design and 30 pound capacity combine to make this one of the most compact baby bouncer seats around. The biggest perk is that this seat actually seats your baby. While most bouncy seats simply lay your baby at an angle with a slight impression for their little bottoms, this seat actually allows them to bend at the hips and lets their legs lay in a natural position. 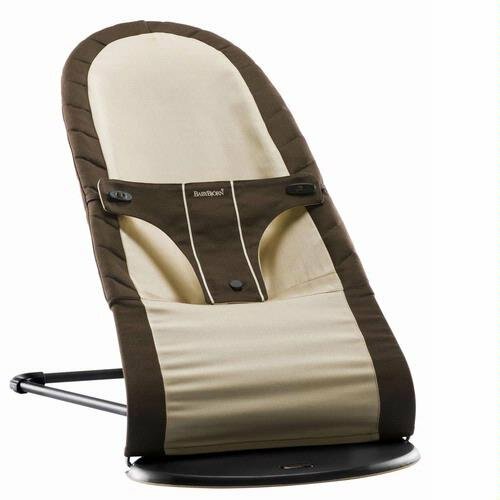 The quality of the materials is also a plus - less plastic and high quality fabrics make this a super durable bouncer seat. The mesh seat also removes and washes quickly making the BabySitter Balance bouncer easy to clean as well as creating the benefit of keeping your baby cool and dry in the warmest of situations. This BabyBjorn bouncy seat also folds up super flat, making it easy to pack and transport, or simply slide under the couch when you're done with it for the day. 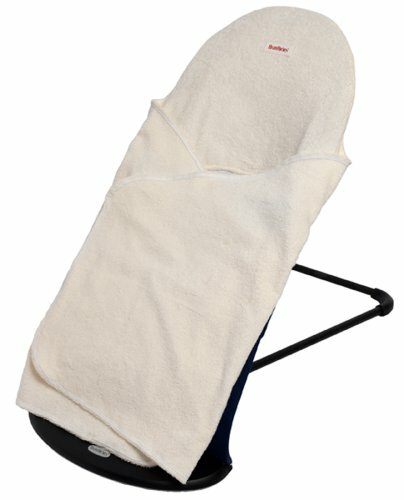 If you're worried about it not being cozy enough then try the BabyBjorn Babysitter Balance Cozy Cover. The super soft terry cloth cover fits around the harness and swaddles your little one in a cloud of softness. We all love gadgets, no matter how modern or green we are. That's why the MamaRoo Infant seat is more than a bouncer seat and more than a swing and more than a gadget... it's a super version of all three, wrapped into one really, really, really cool package. This seat has five different motions, and that doesn't mean front and back vs side to side- we're talking COMPLETELY different motions. The call them the Car Ride, Kangaroo, Tree Swing, Rock-A-Bye and Ocean Wave motions and this contraption actually mimics all of the above. On top of that, it has an MP3 port with built in speakers that have great sound quality and comes with 5 beautiful nature sounds that are on long enough loops that they aren't annoying. And a really cool screen. And it adjusts from laying your baby all the way back into a fully reclined position to sitting up. And the seat zips and unzips instead of having to be wrestled on and off the frame. And it has a plush seating option. And it has completely unique toys that were designed by real artist- not just monkeys and giraffes. And it has a safety option that keeps it from turning on if the recline adjustment isn't locked properly. And it plugs into the wall instead of requiring gazillions of batteries. So what's wrong with it? Nothing. Except that it's big and bulky and requires an outlet to work. It's 20 pounds and and pretty wide... but who cares, when it's replacing the swing, bouncy seat and jumparoo all at once? If all you're really wanting is a bouncer seat that will be a secure place to set your baby down and entertain them, then try the traditional, basic, Fisher Price Bouncer. It has great reviews for durability, is inexpensive and is very cute. Only thing to beware of is, like the Snugabunny Bouncer, the Fisher Price bouncy seats have a wide base that is easy to trip over or stub your toe on. Other than that, though, this little seat is a gem. It doesn't fold, but doesn't break. It doesn't have gadgets, but it doesn't make obnoxious noises. It's a little wide, but it makes up for it by being all of 5.9 pounds and one of the most lightweight bouncy seats available. All in all, it's the most practical and affordable option. And lets face it. Classic is really cute. Again, this is another with a 25 pound weight limit. It's just that hard to find a bouncer for a bigger kid. Maybe try an infant rocker chair if your kid is too big for a bouncer! Hopefully this overview of bouncy seats was helpful!